The department aims at exploring different media technologies and their social, aesthetic, political, ethical, legal, and economic implications. It offers two different courses given in English, one called ”Global Media”, and the second ”Media, Culture & Technology”. Dan Åkerlund has established a collaboration with the Department of Communikation and Journalism at the University of Kerala in Thiruvananthapuram, India. 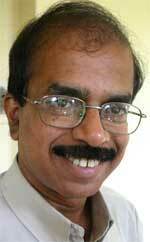 Contact person: Dr K. Subash, Head of the Dept. of Communication and Journalism (photo to the right). Dr. Subash visited Karlstad in May 2006 to further discuss the collaboration, and met students and teachers at the university. From 2005 a Linnaeus-Palme International Exchange Programme is running. Along with Pär Lundgren, a colleague from Karlstad University, Dr. Åkerlund visited Kerala for 5-6 weeks during the Winter 2006-07, and taught at both the Convergence Media Studies course and in the Journalism courses. The department is keen on letting Swedish students of journalism and communication study short courses of high interest at the University of Kerala, courses they will be able to include in their Swedish degrees. Courses of interest for the students of journalism could be those about Reporting, Media Management, Television News, Magazine Journalism, Research Methods, Public Campaigns och Cyber Journalism. Similarly students within Karlstad University’s programme for Convergence Media, find interesting courses in India about Computer and News Media, Digital Media Production, and Writing for News Media. More information about the possibilities for Swedish students (in Swedish only, as a pdf-file) . 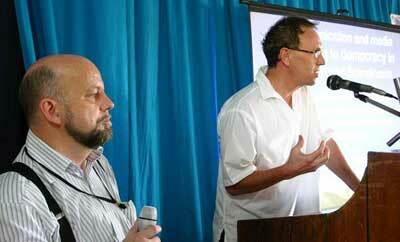 In November 2007, Anna Lindberg and Lars Eklund from SASNET visited Dr. Subash and the Dept. of Communikation and Journalism in Thiruvanthapuram. Read their report. During the winter 2007-08, another teacher from Karlstad University visited University of Kerala, Assistant Professor Hedvig Bergenheim. She spent three weeks at the Dept. of Communication and Journalism. From August 2008, she is no longer connected to Karlstad University. In September 2008, the Dept. of Communication and Journalism introduced a new International 2-year Master’s program on Global Media Studies at Karlstad University. The Programme director is André Jansson. The program focuses upon areas such as cultural industries and networks, intercultural communication, and glocal media policy and social change. It is designed to enable specialized studies within the student’s own area of interest, by means of case studies, essay/thesis writing, and a Global Media Internship. More information about the programme. In June 2010, Karlstad University hosted the World Summit on Media for Children and Youth, a conference held every three years providing a forum for producers, broadcasters and regulators of media for children and other professionals and community leaders committed to the improvement of quality media for children. Dr. Pär Lundgren was Director for the Project management group planning for the Summit. The 2010 Summit in Karlstad was expected to draw 2 000 delegates, including 150 students, from 100 countries all over the World. More information about the WS2010 Summit. – Learning about being a girl from Disney: A study conducted in four countries, US, India, Fiji and China, examines how girls between the ages of 8 -15 perceive images of girlhood in Disney movies (funded by Internationales Zentralinstitut Fur Das (IZI), Jugend-Und Bildungsfernserhen, Munchen, Germany, 2009-2011) . SASNET deputy director met Dr. Uppal at a conference in London in September 2013 (see report). There, she presented a paper on ”Bollystan: An Expanding State (of Mind)”, in which she claims that the international spread of Bollywood films to a large extent is connected to the fact that there are now 25 million people of Indian origin living in diaspora in 110 countries all over the world. Charu later visited SASNET’s office in Lund and had a fruitful meeting with Lars Eklund on Monday 11th November 2013.